The Very Hungry Crocodile by Roald Dahl - All our children absolutely love the ending and although it's quite a long read for a bedtime story it's really well written. The Baby's Catalogue by Janet and Alan Ahlberg - A day in the life of 5 families with really appealing pictures of just about everything your child might observe in a typical day. The Tiger Who Came to Tea by Judith Kerr - A real nonsense story that appeals to boys and girls. I Do Not Like Green Eggs and Ham by Dr Suess - Really easy to read and quickly established as a catch phrase in our family! Almost as popular is the Cat in the Hat. 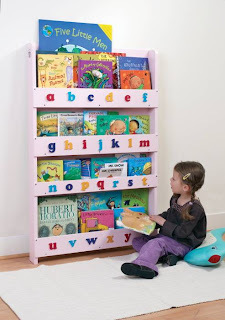 If you would like more ideas on books for babies, toddlers and older children see Building a Children's Library on the Guardian website which is a fantastic resource. If you are wondering how to store your books, have a look at our Tidy Books Bookcase which is designed so that children can easily see their books. We wish these had been around years ago.